Have you ever imagined what volunteering in Cambodia can be like? Meeting the locals, discovering the local culture, working to teach English or other subjects in their local schools, helping rescue and save endangered animals and more! 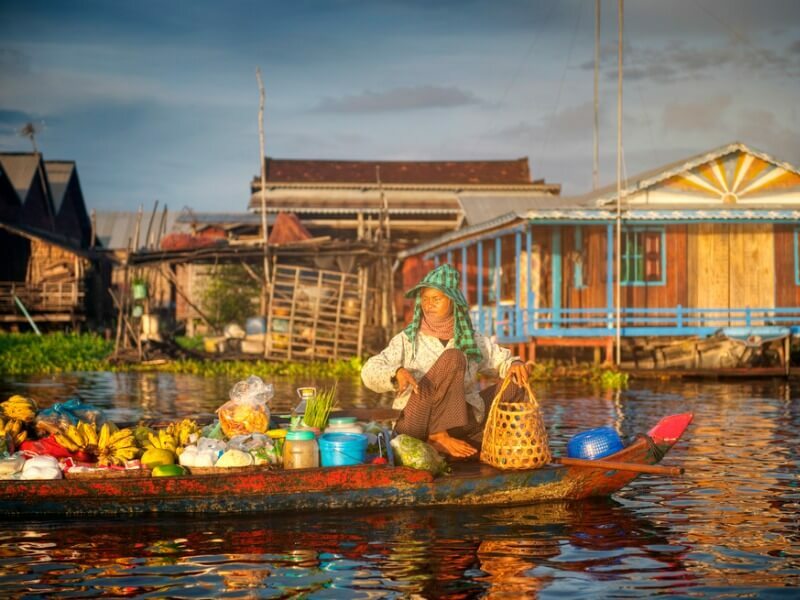 For travelers, Cambodia is a lush locale with inspiring scenery and wonderful people. It has everything from ancient, breathtaking temples to serene, beautiful beaches and bustling markets full of excited crowds and exotic foods. Travelers looking to make an impact in Cambodia will find just as much to love in this incredible country. There is a bevy of opportunities for volunteering in Cambodia that is ethical and responsible, where travelers who want to give back can do a lot of good. Choosing to volunteer abroad while traveling to Cambodia means both time and money are going back into the community, where they are truly needed. Such efforts can help promote positive community development. The best way to find volunteering opportunities that are ethically responsible is to rely on recommendations and credentials for vetted organizations. These are trusted programs and institutions that are invested in their service and their cause. GivingWay is now hosting impactful volunteering group trips to Cambodia this summer to Kep Gardens Association, join us! For a full guide to volunteering in Cambodia, keep reading. Whether travelers are choosing to volunteer abroad in Cambodia for differing time frames, they’ll find boundless opportunities to make a difference. When planning a trip, the first thing to get acquainted with is Cambodia’s climate. Since it’s located in the tropical zone, the area cycles through wet and dry seasons but maintains warm temperatures throughout the year. April and May are the hottest months, when the thermometer regularly climbs as high as 100 degrees Fahrenheit. Plan your trip according to your to arrival in Cambodia, so that you are well packed for the right weather. As far as tourism, November through February is the busiest time. Temperatures cool down comfortably and the dry season is in full swing, which means many travelers are heading over to enjoy the weather. Cambodian currency is the riel. According to the National Bank of Cambodia, one U.S. dollar is equivalent to about 3,999 riel (KHR). The national language of Cambodia is called Khmer, which is an Austroasiatic language, like Vietnamese. It also has heavy influences from Sanskrit and Pali. According to Just Landed, Khmer is spoken by about 90 percent of the population. It’s wise for travelers to study up on the area they plan to visit and make note of the foreign language and the local culture. Learn a few useful phrases to better integrate into the community and connect with locals. While English and Cambodian French are widely used, they are not universally understood. According to the Royal Embassy of Cambodia, a one-month visa is required for all visitors to Cambodia from outside countries, which costs about $30. For those from the U.S., Canada, and the U.K., this can be obtained upon arrival in Cambodia at Phnom Penn airport or the Siem Reap airport. Travelers need to make sure they present a passport-sized photo when obtaining their visa, otherwise, they’ll be charged a $2 fine. A visit to Cambodia would not be complete without an opportunity to spend time and check out at least one of the awe-inspiring temples, which are truly marvels of stone carving and architecture. The Banyon. One of the most astounding of these is the Banyon, a Buddhist temple built in the 12th century. Huge carved faces depicting the Buddhist deity, Avalokitesvara, smile down on visitors. Plus, the temple walls feature at least 11,000 other figures carved in bas relief. Peam Krasop Wildlife Sanctuary. Head to the country’s southwestern border near Koh Kong City and you’ll find this sanctuary, which is home to a unique ecosystem of mangroves. Take the mangrove walk by foot, or hire a boat to explore the series of islands and discover the animal inhabitants. Those who have never volunteered in Cambodia might feel overwhelmed by the sheer number of options before them. Here’s how to weed through them and find the right cause and organization for which to donate your experience and skills and make a real impact. You can check out a very thorough list of volunteering opportunities located in Cambodia here. Volunteering can be life-changing. Travelers who volunteer abroad offering their experience and skills can make a real impact to lives and entire communities in positive ways that help end poverty, promote wellness and health, empower women, and give children in need education that will help them as they grow. Children’s Charities. Volunteering with children’s organizations might involve education, coaching, providing opportunities for play and creativity, teach English, and more. In general, this should exclude volunteering in an orphanage in Cambodia and caring for children. Why? Westerners who donate their time or money to these institutions can, in many instances (and without even realizing), help propagate orphanages that operate like businesses, where the income is more important than the well-being of the children. These children are often subjected to poor conditions to entice tourists to spend money to help improve their lot. In actuality, many of these “orphans” actually have both parents alive and well in the world. According to The New York Times, this practice does little to no good for the children or the local community. Travelers who want to help people while they’re visiting Cambodia should search for non-profit organizations with clear ethical standards where they are able to work alongside local staff, and not instead of them. They should also only work with those charities who help their target communities with upward mobility for the long haul. For instance, choosing to volunteer with organizations which promote community development projects and growth, with a sustainable plan, can be a great choice. Here, you can browse many volunteering opportunities working with children in Cambodia. Working to help animals in Cambodia provides unique opportunities. For one, travelers will get to see exotic species in their natural habitat, an experience few people can claim. For another, they can discover and learn about ideal ways for humans and animals to live together. These are lessons that animal lovers can take home with them and apply. One of the main animals of concern in Cambodia is elephants. Their natural habitat is shrinking, which is a big problem for these creatures because they tend to roam widely in herds. In response, many organizations are working to improve this situation and protect elephants in Southeast Asia. Elephants aren’t the only endangered species in Cambodia. Others include sun bears, various species of gibbons, wild water buffalo, the Irawaddy dolphin, and many more. Often, volunteer opportunities will include working alongside local staff and caring for rescued animals or helping to restore animal habitats (including planting and tending trees or building enclosures). In the cities, volunteering for animal welfare organizations means helping stray or abandoned cats and dogs. Responsible Animal Volunteering. There are a few factors to keep in mind when searching for trusted animal welfare organizations. First and foremost, travelers need to make sure the nonprofits promote responsible volunteering, meaning the animals are not exploited so the organization can earn money. Thus, travelers should be wary of opportunities that advertise “socializing” with the animals. They should also avoid organizations that are obviously not run by animal welfare experts. No mention of credentials, for instance, is a big warning sign. Browse through a list of volunteering opportunities working with animals in Cambodia here. Cambodia volunteer opportunities also include eco volunteering. This can mean protecting natural landscapes and animal habitats, cleaning up pollution, environmental conservation, or educating communities about green initiatives. Whatever the cause, it’s a worthwhile endeavor for any traveler. In Cambodia, eco volunteering could mean working with non-profits that aim to protect precious jungles and rainforests that are slowly disappearing. Education, instruction, and administrative work are all jobs that can help with these initiatives. Some opportunities may also involve going out in the field with the local staff, collecting samples, and documenting various environments to help researchers and scientists. If you’re interested in this cause, you can browse here for many volunteering opportunities in conservation located in Cambodia. Cambodia volunteer opportunities are available everywhere. Trusted organizations are doing great work all over the country. The larger cities are where to go if a traveler would prefer to work with the poor or underprivileged. Phnom Penn, Battambang, and Siem Reap are great places to start. Working with indigenous communities often requires traveling to the more remote parts of the country. For example, the small, isolated village of Sen Monoron is where the Bunong people are centered. In the rural provinces, like Kep and Takeo, volunteers can work educating school children, teach English, and contribute to infrastructure efforts. Volunteering for an endangered animal project in Cambodia, such as an elephant sanctuary, will also require remote travel in most cases. One is located in Mondulkiri, for instance, a province with the smallest human population in Cambodia. Of course, traveling to Cambodia to volunteer responsibly should also go hand-in-hand with responsible tourism. Too often, tourism profits go to companies with money on their minds and nothing else. Travelers who want to put their dollars into the local communities they visit should focus on responsible tourism practices. One way to travel responsibly is by buying local products. Browse local markets, stalls, and shops for handmade, homemade goods and food. Find local vendors and stay away from chain stores and restaurants. Another way to put money directly back into the local community, and promote community development, is to use home-stays instead of hotels. Home-stays are where travelers lodge with residents in their homes. In this opportunity, the residents provide hospitality, local knowledge, beds, and even meals to their guests. Imagine waking up in the home of a local in Cambodia and being able to see their customs, food, and lifestyle from a personal perspective. They might even be amenable to giving tours of the area or pointing out the best spots to eat or attractions to see. This is a wonderful way to get to know locals and engage with the community the way a local would. Whether travelers are focusing on short or long term volunteer program in Cambodia, they can make a difference with the right approach. However, there are a few key points to remember for your time in Cambodia. First, volunteers should make sure they know exactly where their money is going. Some nonprofits are better funded and more established than others, which means the volunteer program fees can vary. At times such fees only cover the direct expenses associated with the volunteer’s stay. Other times the fees also cover weekend adventures or donations to the organization. The best practice is to simply ask the organization about the fees, and see that it fits the travel budget. Second, in order to find an ethical and responsible Cambodia volunteer foundation, travelers need to be discerning. They need to check an organization’s practices and mission, make sure the brunt of proceeds help the stated cause and check that the intended impact is both positive and lasting. The above can seem like a tall order to fill and can be overwhelming for travelers who simply want to help others or improve the world around them. Researching organizations online is recommended before signing up with them. Volunteering in Cambodia is an incredibly worthwhile endeavor. There are countless projects abroad that offer opportunities to do good work in communities, for the environment, and for endangered, abandoned, or stray animals. Travelers should be prepared to enjoy what the country has to offer on top of their volunteer work while they’re visiting Cambodia. There are feasts for the eyes around every turn, including stunning architecture and beautiful vistas. Volunteers should get acquainted with key phrases from local languages, understand the currency and exchange rate, and note places they want to go as well as their philanthropy interests. These are all keys to having a great trip and a fulfilling project abroad. Discover and connect with ethical volunteer organizations who do good every day. Join a volunteer program in Cambodia that speaks to both heart and mind. Check out Giving Way and make giving back a given while traveling.